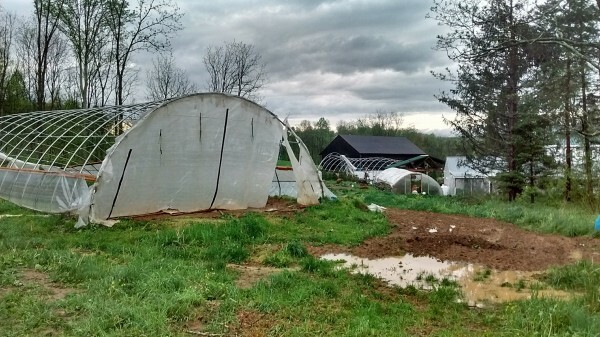 The storm damage at Clan Stewart Farm included a destroyed greenhouse. Curiously enough, the farm’s 150 year old barn survived with minimal damage. “It’s interesting in this day and age of steel and technology that a century-and-a-half-old barn sitting on a square survived,” Stewart said. The timing of the damage is an added challenge, Stewart said. He is concerned about additional losses due to the upcoming cold weather expected this weekend and next week. Stewart added that despite the risk to their plants, the storage facility will probably be the priority. They will need to shelter their farm equipment to protect from elements. Along with the family business, the damage is significant due to the farm’s historic significance. Purchased in 1793 by William Penn’s son, Stewart noted that his mother is generation number six at the farm, he and his siblings are technically generation seven, and his niece has shown interest in farming and she would be generation eight. The farm at one time was a dairy farm, then beef cattle and other livestock, and eventually became what it is today, a well-loved local vegetable producer with side offerings such as baked goods. So, as a member of the local food community, how can you help? Stewart said that they are still waiting on insurance adjusters so they have a demolition party as yet, where people can come and help them tear down damaged buildings and remove downed trees. He noted that the buildings might not be covered because they are not considered brick and mortar structures, but movable ones. With that in mind, the farm is running a GoFundMe campaign, and Friends & Farmers Cooperative is running a separate one to support Clan Stewart. You can also purchase bake shop items on the Friends and Farmers Online Market. If you have ever met Clan Stewart folks at a farmers market or elsewhere, you know they are good, friendly people, and they need help now recovering from this serious blow to their historic farm. Now is the time for us, the local food community in Central Pennsylvania, to please step up and help one of our own.